Juvenile squirrels are usually put in an outside pre-release cage at about 12 weeks of age and released about a month later. By then they would have proved to their carer that they are completely confident with their climbing and jumping, that they can crack nuts and build a nest (collect and arrange nesting materials). There are two main types of release: soft and hard. Hard release means simply taking the juvenile squirrels to a suitable place, letting them out of the animal carrier and hoping for the best. Several major rescue groups in this country practice hard release, but it is generally believed that it does not give the squirrels as good a chance of successfully integrating into the wild (i.e. surviving) as soft release. 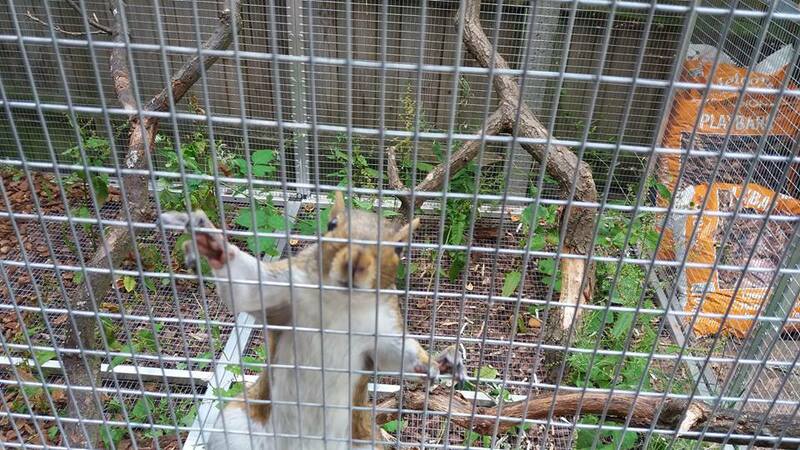 Soft release means that the squirrels, once they arrive at the release site, are put into a release cage (it may be smaller than the pre-release one, but still big enough for them to climb and jump around). After a couple of weeks a small door is opened, and the squirrels are free to come and go. After a while the squirrels stop coming back, though they very often continue to hang around the same area, especially if food is provided. Food is generally provided for a couple of weeks after the squirrels have stopped coming back to the release cage in the case of a summer release, and throughout the winter in the case of an autumn release. Nest boxes are often put up at the release site to help the squirrels over the initial period. Sometimes they continue to use them, sometimes they move on to make their own dreys. Overwintering may be necessary if the babies are born too late in the summer and the autumn weather is too cold by the time they turn 12-14 weeks. Overwintered babies are then released in spring or summer, following the same procedure that is used for younger ones.